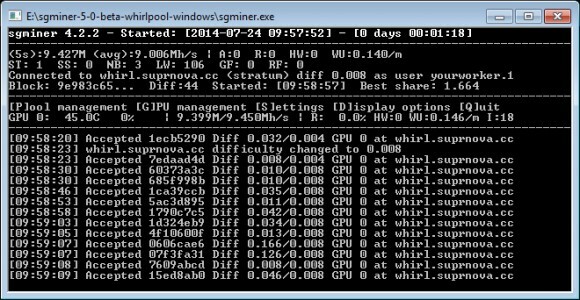 There is now a new fork of sgminer 5.0 beta that brings Whirlpool algorithm support for mining crypto currencies such as Whirlcoin on AMD-based GPUs. The new fork by a user called uraymeiviar (source) and it brings a nice hashrate improvement over the previously available sph-sgminer fork by djm34. We have compiled a windows binary from the new source and have already tested it on an AMD Radeon R9 280X GPU, the result we got was 9400 KHS, so about twice as fast than previously in terms of hashrate. You can download and try the windows binary yourself from the link below. Do note that this version of sgminer also supports most other new algorithms, so you an use it for mining not only Whirlpool coins, but others as well. Also make sure to be using the latest 14.6/14.7 beta drivers from AMD in order to get the best performance. It did not take much time for the AMD miners to also get a GPU miner for the new Whirlpool algorithm and Whirlcoin, the first coin to use it. We now have a sph-sgminer fork with whirlpool support added again thanks to djm34 (source), the guy that just released ccMiner fork with Whirlpool support. We have compiled a windows binary from the latest source and have already tested it on an AMD Radeon R9 280X GPU to see what performance we are going to get – the result was 3300 KHS. You can download and try the windows binary yourself from the link below. 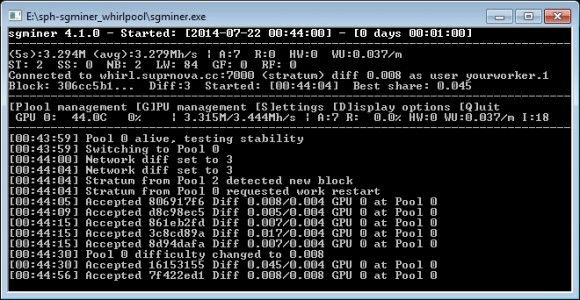 Do note that this version of sph-sgminer also supports most other new algorithms as well, so you an use it for mining not only Whirlcoin. Also make sure to be using the latest 14.6/14.7 beta drivers from AMD in order to get the best performance and currently it seems that Nvidia GPU miners have some advantage in terms of performance for this algorithm. Update: The miner has been updated to include the new updated whirlpool kernel that increases performance. With the new kernel we are getting a boost from about 3300 KHS to about 4750 KHS on a Radeon R9 280X GPU, so definitely worth upgrading if you are mining whirlcoin for example with AMD GPUs. Just redownload the miner to get the updated kernel and take advantage of the significant performance boost for whirlpool algorithm mining. 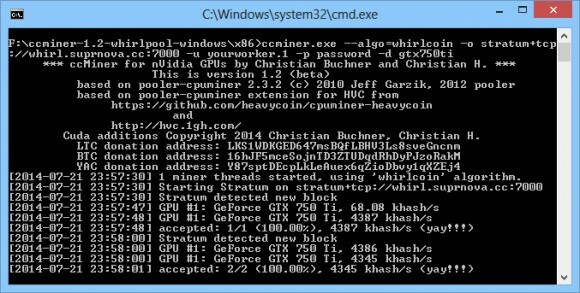 WhirlCoin is the first coin to use the new Whirlpool algorithm and while it was CPU only coin originally now there is support for GPU mining on Nvidia available thanks to djm34’s fork of ccMiner that just got whirlpool support added (source). We have compiled a windows binary of the new release and on a GeForce GTX 750 Ti video card we are getting a hashrate of almost 4400 KHS and about 11500 KHS on GTX 780 Ti. Have in mind that this ccMiner fork does support not only whirlpool algorithm, but many other as well, including whirlpool for example and other newer ones as well. For the moment there is still not AMD GPU minor available for this new algorithm, but there will most likely soon be available a fork of sgminer.